On telling stories about the collision of reason and human nature. “Clearly, we’re interested in facing uncertainty…not only in art, but life,” Annie J. Howell says with a laugh following the premiere of “Claire in Motion,” though it’s worth noting you’d only know that by the themes she explores in the films she makes with writing/directing partner Lisa Robinson, not from the assured way the two have made them. “Claire in Motion” marks a triumphant return to SXSW after their first feature, the comedy “Small, Beautifully Moving Parts,” about a young pregnant woman’s search for her own, long-absent mother in advance of her giving birth, premiered at the festival in 2011. For those who caught the smart, nuanced look at a tech expert who suddenly has to readjust her life in a way that requires emotion as much as logic, Howell and Robinson’s second feature might feel like an intriguing continuation of that idea, following a mathematician (Betsy Brandt) whose husband disappears on a hike under mysterious circumstances and the only clues she has for the possibly unresolvable situation is to investigate the connection he had with an enigmatic art student (Anna Margaret Hollyman) that was under his tutelage. But whereas “Small, Beautifully Moving Parts” saw the lighter side of experiencing such a major life transition, “Claire in Motion” explores the darker side, observing Brandt’s newly single mother allowing her mind go to places she would never have imagined before in the absence of her husband, for better or worse. With a particularly compelling performance from Brandt (as well as a piquant turn from Hollyman), the film thrusts Claire into a crisis that Howell and Robinson once again bring a unique perspective to as their heroine’s heart is at odds with her head in a way that feels uncommonly progressive and provocative. Shortly after the film’s premiere in Austin, Howell and Robinson spoke about how “Claire in Motion” was inspired by Howell’s time at the Ohio University, reconsidering the quirks that made their first film so charming to play into a sense of paranoia for this cerebral thriller, and the film’s intuitive shooting style. One of the things I like most about your films is the idea that how these people think is so connected to what they do and who they are, so it’s interesting to see how they behave once you put them in a situation they can’t reason out of easily – is that actually a starting place for you? Lisa Robinson: Yeah, I think a lot of people try to make sense of their lives. Some people are maybe more naturally rational because of their careers, but we were interested in a situation of a woman feeling like she knew what her life was – she had probably rationalized it all out, this is how it was going to be, this is who her husband was, this is who her kid was, this is what her job was and was coasting on that and no longer maybe is open to change in herself and in her partner, so she was a little distracted and this [situation] upends that. Annie J. Howell: Yeah, she was waking up in the midst of this. Lisa Robinson: And the two characters are similar because Anna Margaret[‘s character Alison] was making sense of the world in the way she could, which I think most people do. That said, Anna Margaret’s character Alison is so interesting – she’s got a new-agey, artistic side that’s incomprehensible to Claire – that it feels like she had a whole other movie going on when she isn’t in this one. Was she a natural outgrowth of Betsy’s character or developed separately? It was so much fun to write that character Alison because she’s so complicated and so seemingly supportive and warm, but all is not as it seems. I don’t even know if we learn what her motivations are, but we learn how complex she is. Lisa Robinson: Yeah, her needs are different and suggest some wounds that she’s dealing with in her own way. We wanted her to be a character that wasn’t like a classic femme fatale or siren, someone who was a little provocative and even questioning our [main] character towards maybe another way of looking at things that would be better for the long term, pushing her out of her spaces of thinking. That was interesting to play with – someone who’s sometimes a truth teller that you’re not quite sure of. You mentioned at the premiere Ohio University helped inspire this? How did this story emerge from that setting? Annie J. Howell: I just moved back to New York, but my family and I had been living in Athens, Ohio for the last six years. We knew that it was a natural progression to make a film there because it was a really unusual location and had all this versatility with this natural forest nearby, plus a really supportive film community. It’s just an area of the country that you don’t really see very often on screen or at least not in that context and we wanted to up the stakes thematically for a protagonist. We started to think about a dire situation that could really also hold some of the same themes that we were interested in. You take advantage of the men’s choir, for sure. How did they make it in? Annie J. Howell: That’s The Singing Men of Ohio. They really do just pop up. I was at a fundraiser for the arts and they were singing. They’re huge on campus – they perform concerts, they wear their green jackets and everyone knows who they are. For Claire, we thought some of the unique and slightly odd characteristics of small-town or university life like the clown car or the Singing Men were just so rich and fun to add to her world. She’s in her head with this crisis, so the oddities and unique qualities of a small town [add to the anxiety]. Lisa Robinson: Also, there’s this other life happening. People are changing, people are doing interesting things, so instead of making it so narrow, these things were opening her up, like something that could lift her or take her in another direction. Which is interesting to me because “Small, Beautifully Moving Parts” had some of those same quirks, but used to create a very different tone. Was it fun to do something similar but towards an opposite end? Lisa Robinson: We were interested in using suspense a little bit. The style and the tone really came from getting inside her mind and the idea we had was, “Okay, how does this film get closer to her rather than just looking at her?” The subjective cameras were a big part of it getting inside her mind, like, “What the blank is going on here,” and trying to understand her world. Because that is an eerie experience. It was fun to play with that stuff and still offer some of these elements of the oddity of life, sprinkling them in ways that were putting her a little off balance so it wasn’t all suspense, all sad story [all the time], but it wasn’t like we set out to make this tone of a movie as much as we’re really interested in her take on her experience. How did Betsy Brandt come to mind? Annie J. Howell: We were working with a really talented casting director and she responded to the script and we were all able to make it happen. We were just really fortunate to have her. Here, she does have this amazing quality where she can feel alone in a room even with other people – is a lot of that her or is that something you had to figure out in filming Claire? Annie J. Howell: Her performances is certainly a huge element but then we were really working to push other characters a little bit toward the edge of the frame, or really out of focus. Someone last night [at the premiere] asked, “Why are you guys always behind her?” Really, we were trying to be right by her shoulder so that it’s really not allowing those other elements to get too close to create this space around her so that the audience can feel that intimacy with her. Was doing this the second time around any different than the first? Lisa Robinson: The crew was bigger, and the production was just bigger in general so we definitely had that. We probably had more collaborators on set, which was great. We had amazing costume designer Naomi Wolff, who brought these amazing clothes, including some from her own closet, that blew our minds. There’s a sweater that Anna Margaret wears that’s sort of white and had a colorful pattern that’s [Naomi’s] grandmother’s. Betsy was also amazed when she saw the clothes that she [said], “Oh, this helps me so much to get into character.” Things like that we really didn’t have as “Small, Beautifully” on that level. That helped us so much. We had a production designer [Emmeline Wilks-Dupoise] who was sourcing stuff from the local town – I remember we needed a picnic table and she’s like, “Hang on.” She asked a neighbor and two minutes later, this picnic table is coming to our backyard. We had all these amazing people — Andreas Burgess, who was an amazing cinematographer. This time, we had a great team – not that we didn’t before, but we just had more of them so we could focus more on the art part of it rather than all the logistical [details]. If this took a while, and you’re living your life and you’re thinking about different things, at the end you think something different about this than you did at the beginning? Annie J. Howell: Yeah, “Small, Beautifully” was written pretty quickly. We had been working with those characters for the web series and this simmered on the stove for longer, which I think really was a good thing. It did change. We were looking for our next idea and we had a few iterations before we settled on this. That was new and a little bit different, but really in the end, it was all for the best because this seemed to be the right story to tell in that town with this cast. I don’t live there anymore and I’m glad that it all unfolded the way that it did and we made that film. 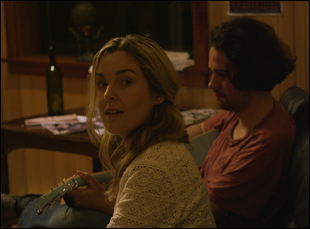 “Claire in Motion” opens on January 13th in Los Angeles at the Laemmle Music Hall. It will also be available on iTunes. Interview: Josh Locy & Andre Royo on Following Bliss for "Hunter Gatherer"
Interview: Trey Edward Shults on a Family Affair to Remember in "Krisha"